This 2 bedroom apartment is on the penthouse floor of a fully restored former Spanish Colonial residence located in the heart of Viejo San Juan (Old San Juan). 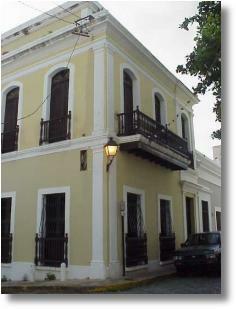 Revisit the Old Spanish architectural charm by spending your vacation in the historic Old San Juan district. This home is located within walking distance of all the tourist attractions, restaurants, and night-clubs this beautiful part of the city has to offer. 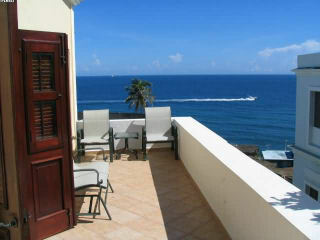 It is also within walking distance to all Cruise Ship mooring docks, and the famous El Morro. This three story home has been completely restored to its original Spanish splendor with full Spanish-style doors and open living concept; spiral staircase leading to rooftop for a 360 degree panoramic view of old San Juan overlooking original coblestone streets; and original color scheme. It is tastefully decorated and furnished throughout with all modern amenities. A 2 bedroom 1 bath apartment located on the third floor of a fully restored Spanish Colonial residence that has been converted into a guest house. It has a modern fully equipped kitchen, ceiling fans, Cable TV and Stereo, all bed linens, full balcony, located in the popular Viejo San Juan (Old San Juan) tourist district of San Juan, Puerto Rico. $3,500/month +electricity no more than 8 guests " 3 night min."